When handled properly, wood pellet fuel is safe and benign. Wood pellets are made by drying and compressing pure wood particles. Naturally occurring lignin softens during pelletizing and then hardens during the cooling process to bind wood particles together as pellets. It is hard to imagine how such a pure product could be dangerous. Unfortunately, over the years, there have been instances where wood pellets have been handled improperly, resulting in serious injuries and even fatalities. In May 2002, during the discharge of pellets from British Columbia onboard MV Weaver Arrow in the Port of Rotterdam, one stevedore died and several other workers were injured after entering a ship hold where wood pellets had generated carbon monoxide (CO). A similar fatal case occurred in November 2006 onboard the MS Saga Spray in the Port of Helsingborg, Sweden, while the vessel was, again, discharging wood pellets from British Columbia. One seaman was killed, a stevedore was seriously injured and several rescue workers were slightly injured after entering an unventilated stairway next to a cargo hold. Other incidents caused by the release of carbon monoxide from wood pellets have occurred beyond ships’ cargo holds, including three deaths in Europe since 2010, caused by entry into wood pellet storage facilities on domestic sites. At the end of January 2010, a 43-year-old engineer died in a small town in Germany after he opened a pellet bunker door. A second worker who was standing right behind him was also affected but still able to call the emergency services. The pellet bunker had a storage capacity of approximately 155 tons of pellets, supplying about 700 households with heat. In November 2010, a 38-year-old man in Ireland died after entering the 7-tonne wood pellet storage room for his boiler. His wife and another man were treated in hospital after trying to pull him to safety. Another fatality occurred in February 2011 in Switzerland, where a 28-year-old woman who was four months pregnant was found dead in an 82-m3 pellet storeroom. The wood pellet heating system supplied 60 households. In this instance, there was a problem with the wood pellet conveyor, so the caretaker’s wife went to inspect the problem on his behalf. As the woman’s body was found almost completely wedged beneath the circular cover above the opening of the screw conveyor, it was initially assumed that the accident was primarily of a mechanical nature. However, when external examination of the body revealed bright red lividity of the skin and fingernail beds, giving rise to the suspicion of CO poisoning, the body was sent for a full postmortem examination. Wood pellets generate CO and cause oxygen depletion. This means that closed storage spaces must be ventilated and tested for the presence of CO before a person can enter safely. Dust from wood pellets in high concentrations is explosive if exposed to an ignition source. To prevent explosions, wood dust should not be allowed to accumulate beyond 3-mm depth. Electrical equipment near wood pellets should be grounded to prevent static discharge. Cleaning of storage and work areas should be done by sweeping or with the use of an electrostatically secure vacuum system. Never use compressed air for clean-up. If a front loader is used for moving wood pellets on the floor, the edge of the bucket penetrating the floor shall be equipped with non-metallic electrically dissipative material to avoid electrostatic build-up and sparks. For sensitive persons, wood pellet dust may cause mild skin irritation, may cause allergy or asthma symptoms if inhaled. When exposed to moisture and temperatures above 60C, wood pellets are susceptible to self-heating and the potential to catch on fire. 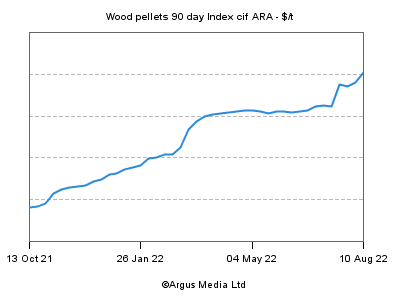 Ideally, wood pellets should be stored below 30C. In large-scale storage, temperature sensors connected to an alarm system are recommended to detect high temperatures and potential fires. When exposed to water, wood pellets will swell by about three to four times. This means that water should not be used for fire fighting in enclosed pellet storage vessels. Instead, nitrogen and carbon dioxide should be used for fire fighting. If pellets do catch on fire, puncturing storage containment is not recommended since the pyrolysis gases developed inside the containment are highly flammable and might explode or violently catch fire once in contact with air. Following the 2002 fatality in Rotterdam, WPAC’s research director Staffan Melin created a material safety data sheet (MSDS) which described the hazards of wood pellets and safe handling procedures. Then, beginning 2007, after the fatality at the Port of Helsingborg, Melin, together with the Biomass and Bioenergy Group (BBRG) at the University of British Columbia (UBC) carried out comprehensive research on wood pellet off-gassing. Subsequently, Melin produced two new versions of the MSDS: one for bulk pellets and one for bagged pellets. In 2015, Canada passed a Hazardous Products Act which set out new information requirements for hazardous materials. Canada aligned its Workplace Hazardous Materials Information System with the Globally Harmonized System of Classification and Labelling of Chemicals. This meant that WPAC’s MSDS now needed to be replaced by a newly formatted document with additional information, now known simply as a Safety Data Sheet or SDS. For the past year, Melin, on behalf of WPAC, has worked on two new SDS documents for bulk and bagged wood pellets. The new SDS documents are compliant in all respects with Canadian requirements as well as those of the Globally Harmonized System of Classification and Labelling of Chemicals. The new documents are now complete and ready for distribution. The former MSDS documents are now obsolete. The new SDS documents – which have been copyright registered in Canada and the United States – are available for use by all WPAC members at no cost. Members who wish to rely on the new SDS documents are required to sign a license agreement with WPAC. In return, WPAC will supply each licensee member with a customized, unalterable form of each SDS document, which the member can then copy and distribute to all parties along the supply chain from plant to customer as a means of ensuring that everyone who is involved in handling wood pellets is aware of the hazards and will handle the wood pellets safely. An obvious question is, “Why the need for a license agreement?” The answer is to protect WPAC from liability. WPAC was highly diligent in researching and preparing the new SDS documents. Nevertheless, there are bound to be some along the supply chain who will ignore or fail to follow the advice in the SDS documents. This means that there is a risk that there could be future catastrophic incidents and we need to ensure that WPAC is indemnified from the risk of such incidents. Moreover, we need to ensure that the documents that we issue are not altered and that as new information becomes available, we have a process to update and circulate new versions of the SDS documents to licensed users. We hope that the information contained in our new SDS documents will help eliminate future pellet-related injuries and fatalities. WPAC would like to thank Staffan Melin for his efforts in researching and creating the new SDS documents.